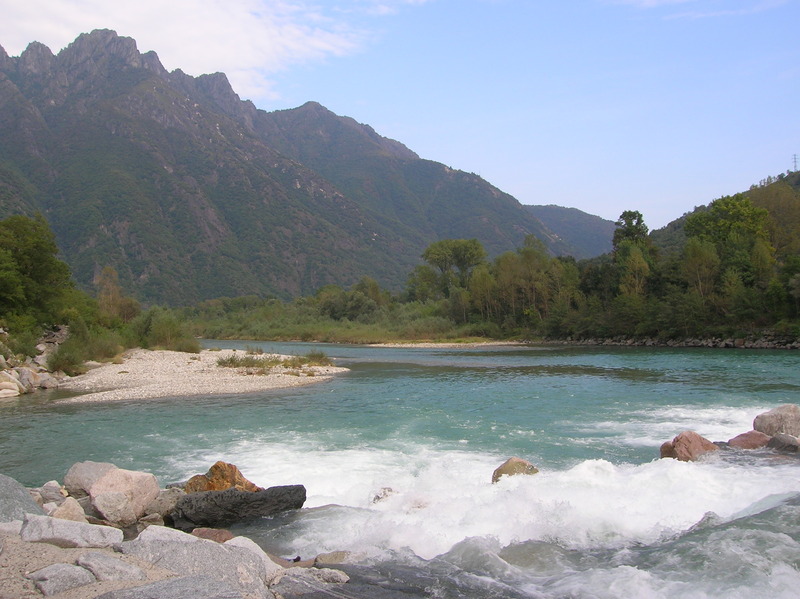 The project actions involve Toce river, which is one of the last watercourse in the Po River basin holding a residual marble trout population (both resident and lake-migratory form) and San Bernardino stream, which is the main water connection from Val Grande to Lake Maggiore. The lake of Mergozzo is a small and deep lake in a context of foothills. It is 2,5 km long and 1 km large with a total area of about 1.8 km2 while the circumference measures 6 km. The maximum depth is 74 m, for a total water volume of nearly 83 million m3. The catchment include many small tributaries such as the Rio Bracchio, Rio Fighera, Rio Nibbio, Rio Bettola and Rio Albo. The lake lies entirely in the municipality of Mergozzo, while a portion of the basin lies in the municipality of Verbania. The lake is oligotrophic/ultraoligotrophic and has an high transparency during the whole year. Datagathered by the CNR-ISE during its long history of research have shown a decrease of the totalphosphorus concentrations from 10-12 mg/lduring Seventies to the present 4 mg/l. Ammonium is low, oxygen reaches 10-11 mg/l along the whole watercolumn, transparency is high (10-12 m in late winter) and the overall water quality of Lake Mergozzo is good. This site is of extreme importance for native biodiversity. The fish fauna was historically characterized by the presence of Rutilus pigus, Chondrostoma soetta, Cottus gobio, Alosa fallax lacustris and Salmo marmoratus. The most recent fish survey carried on Lake Mergozzo was done in the course of LIFE+ Inhabit project(2011). It has been shown that the situation of the fish fauna became critical for some endemic species such as Rutilus pigus and Chondrostoma soetta, which were no captured. Cottus gobio is present in some small tributaries but the information is limited to verbal communications. Although the human pressure on the lake increased significantly in the last 15 years, some other fish species are still present such as the shad Alosa fallax lacustris and Padogobius martensii. The SPA “Fiume Toce” and the SCI “Greto Torrente Toce tra Domodossola e Villadossola” included within the SPA consist of a large bed of pebbles with sand islands and riparian shrubland. Along the Toce were detected some habitat of Community interest, mostly hygrophilous and riparian plant communities, including the riparian forests of white willow (Salix alba) and black poplar (Populus nigra) (habitat 91E0); shrub vegetation in Myricaria Germanic (habitat 3230); the riparian willow shrub with Salix eleagnos (habitat 3240); the aquatic vegetation of still waters (habitat 3150). On fluvial terraces with more evolved soils there are hay meadows (habitat 6510). The river Toce is of considerable ornithological importance, both for nesting and migration, so as to have been identified as a Special Protection Area for birds. Of the numerous nesting species, 70 out of about 150 reported in total, 7 are included in the All. I of the Bird Directive; among the latter, related largely to the shrub and herbaceous plant communities of shore, can be cited Lullula arborea, Calandrella brachydactyla, Anthus campestris, Caprimulgus europaeus, Sylvia nisoria, Circaetus gallicus and Bubo bubo. The waters of river Toce host a significant fish population, including some species of the Habitat Directive: Lethenteron zanandreai, Barbus meridionalis, Telestes souffia, Salmo marmoratus, Cottus gobio, all included in Annex II. The herpetofauna has 9 species, 2 amphibians an4 d reptiles of Community interest. Remarkable is the presence of the Natrix tessellata, Ann. IV of HD, species that prefers the rivers, known in the rest of the province in just three other sites, and generally declining for the artificial state of the river banks. Among mammals, 20 species in total, 10 belong to the bats, all protected under the Habitats Directive. In his first mountain stretch, the River Toce, with a torrential regime, shows a fish community dominated by BROWN TROUT with well-structured populations in general, and also relatively abundant. Under the potential is the presence of the BULLHEAD or SCULPIN, as well as the MARBLE TROUT, this only with a few specimens often with signs of hybridization with the BROWN TROUT. Going downstream, the valley fish community is represented by species typical of a similar environment as MARBLE TROUT, present with a population relatively abundant and balanced, BULLHEAD or SCULPIN, MEDITERRANEAN BARBEL, ITALIAN RIFFLE DACE and occasionally GRAYLING. Going downstream toward the lake, ITALIAN RIFFLE DACE is the dominant species, but among the minnows are also good populations of CHUB and EURASIAN MINNOW. Among the Salmonids there are both MARBLE TROUT and BROWN TROUT with balanced and consistent populations.Near the lake, there are LAMPREY, STICKLEBACK, GUDGEON and BURBOT. In the final stretch before the mouth, the fish community of the Torrente S. Bernardino is composed mainly of Cyprinids whileSalmonids are represented by a population quite poor of BROWN TROUT and some adults of MARBEL TROUT. The dominant species are BULLHEAD or SCULPIN, CHUB and ITALIAN RIFFLE DACE. It also presents the MEDITERRANEAN BARBEL and BARBEL and some specimens of BURBOT probably from the lake. The fish population of this stretch is typical of a bottom valley watercourse, influenced by the movement to and from the lake of some species. In fact, the entire watercourse is mostly torrential and presents a fish community formed mainly by BROWN TROUT and to a lesser extent by BULLHEAD or SCULPIN. The park is mostly uninhabited and is covered 42% by forests, 27% by natural vegetation, 18% open space, 6% from grazing lands and meadows, and 0.1% from surface water. The Val Grande is designated also as IBA – Important Bird Area – by BirdLife International (IT005). The environment of the Park represents a set rich and composite that characterizes the Alpine bioregion, especially for its location next to other significant areas and ecological corridors such as Ticino, the Po Valley, the Toce and Lake Maggiore. Even tough it’s a very small space, the Val Grande is in fact covered by the most of ecosystems present in the Alps Lepontine. Among the habitats, the wood formations with beech, chestnut, lime and ash tree are prevalent; they are acidophilus vegetation with sub-oceanic character on crystalline substrates, developed in sub-mountain and mountain horizon. The beechwood, in particular, is the hallmark as it covers most of the forest land. As formations shrubs are the alpine moorland and scrubland that characterize the areas once dedicated to pastures, with mixed covering of green alder, rhododendron and blueberry. In addition, the morphology and orography of the area determine the distinctive environments of gorge, ridges, crags, cliffs, scattered boulders and scree. The habitats of Community interest are several: 9110-Luzulo-Fagetum beech forests; 8220-Siliceous rocky slopes with chasmophytic vegetation; 9260-Castanea sativa woods; 4060-Alpine and Boreal heaths; 6230*- Species-rich Nardus grasslands, on siliceous substrates in mountain areas (and submountain areas, in Continental Europe); 91E0*-Alluvial forests with Alnus glutinosa and Fraxinus excelsior (Alno-Pandion, Alnion incanae, Salicion albae); 8120-Calcareous and calcshist screes of the montane to alpine levels (Thlaspietea rotundifolii); 9180*-Tilio-Acerion forests of slopes, screes and ravines and 6150-Siliceous alpine and boreal grasslands. Currently the management plan of the SCI / SPA that will lead to an update of this list is in preparation. Regarding the species of Community interest, among the mammals the Hazel Dormouse (Muscardinus avellanarius) is present, while among the bats an initial investigation has found the presence of 16 species. Lynx (Lynx lynx) and Wolf (Canis lupus) have an irregular presence in the province. Numerous and of particular interest are birds such as the Golden Eagle (Aquila chrysaetos), Peregrine Falcon (Falco peregrinus) and Eagle-Owl (Bubo bubo) which are sedentary and nest inside or in the immediate vicinity of the Park, the Honey Buzzard (Pernis apivorus), the Black Kite (Milvus migrans) and Short-toed eagle (Circaetus gallicus) are migratory and can be observed only in spring and summer during their reproductive period. Still others such as the Red Kite (Milvus milvus), Hen Harrier (Circus cyaneus), Marsh Harrier (Circus aeruginosus) and Osprey (Pandion haliaetus), use the territory as migration route or as a place for wintering. Also worthy of note are the different species of peaks, including the Black Woodpecker (Dryocopus martius), and some Passeriformes such as the Western Bonelli’s Warbler (Phylloscopus bonelli) and the Red-backed Shrike (Lanius collurio). The alpine species of Galliformes are under study and conservation strategies, as European level is recording a general scarcity mainly due to the modification and fragmentation of their habitat: Black Grouse (Lyrurus tetrix), Rock Partridge (Alectoris graeca) and Hazel Grouse (Tetrastes bonasia) are today regularly present while the Ptarmigan (Lagopus muta), well represented until 1950 and reported until 1998, is believed extinct, at least as a nesting species. Among the reptile species of Community interest there are the Common Wall Lizard (Podarcis muralis), the European Green Lizard (Lacerta viridis), the Smooth Snake (Coronella austriaca), the Green Whip Snake (Hierophis viridiflavus) and the Aesculapian Snake (Zamenis longissimus). The fish fauna of the Park is dominated by the Brown Trout (Salmo trutta), while the populations of Italian Riffle Dace (Telestes souffia) and Bullhead or Sculpin (Cottus gobio) are in a rather critical conditions.